I am not particularly lady-like. I clean up well, but I am more motorcycle boots and faux fur hats than court shoes and pearls. I am relentlessly fair, but not particularly thoughtful. I am the one forever apologizing empty-handed on the doorstep. My house is Virgo clean but my towels don’t match. I am loud, opinionated, sometimes caustic; often caustic. I do not titter, but guffaw. I have, more than twice, spit my drink across the table. My speech is peppered with a dictionary full of very un-ladylike words, though years ago, after hearing my 2-year-old exclaim “Jesus Christ!” from the backseat, I tried valiantly to change my four letter ways. I somewhat successfully convinced my children I was really saying “Cheesy Rice!”. I may not be lady-like, but even I draw the line at toddler blasphemy. I wear a lot of leopard print. And hot pink. Sometimes together. And I have tattoos. 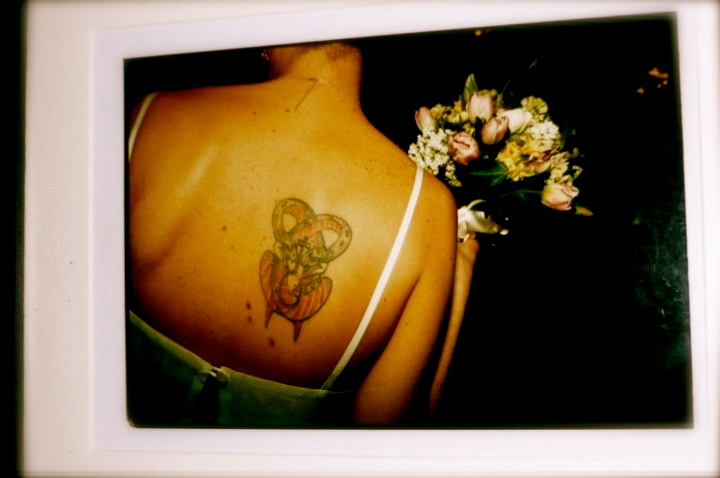 When I got my first tattoo nearly 21 years ago, it was illegal in New York City. 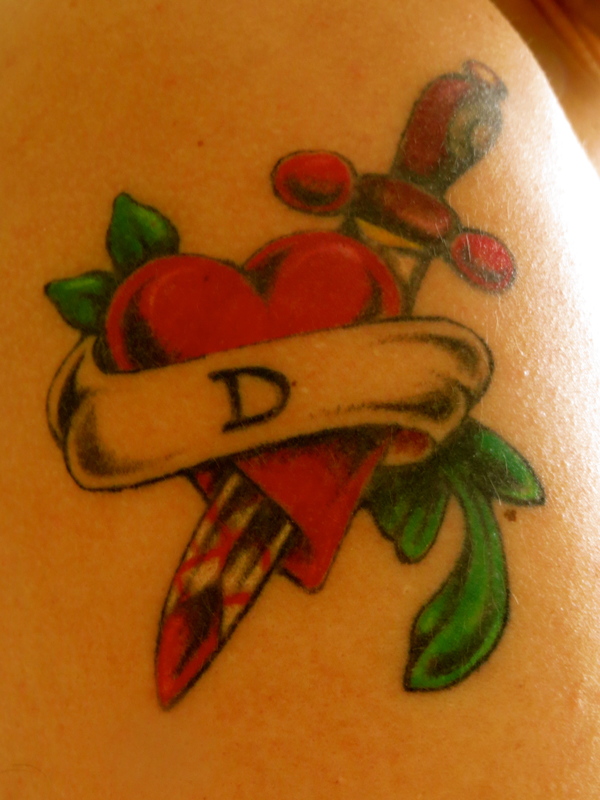 Tattoo work was word of mouth, who you knew who knows someone, done out of smoky living rooms and dim kitchens. There was something down and dirty, something illicit, something seedy about getting a tattoo back then. Unless you were tight with the Hell’s Angels on 3rd Street and 1st Avenue, you had to go out of your way to get inked. When you have to go through back channels and make appointments and there’s a niggling public service-like worry about AIDS and hepatitis, you don’t just stroll in drunk and ask for a smiley face on your hip. You make sure you know what you want before you get there. And sure, there was a aura of punk-rock, rock-a-billy, not everyone has one cool about it back then. At 22 I was full of anger and righteousness. The Gulf War was in full swing, Roe V. Wade was under attack. ** I was reading Susan Faludi and Naomi Wolf and Susan Brownmiller, high on indignation, rallying cries of take back the night over pints of dark beer on Avenue B. I was a year away from reading Audra Lord and Adrienne Rich in college, a year away from putting names to theories and legitimizing that indignation with education, but it was clear to me that my silently vibrating rage was permanent enough to withstand a life-long reminder needled and inked onto my skin. Perhaps it was inevitable that I chose snakes. The serpent; the downfall, the shame, the root and cause of original sin–but only within Christian mythology. 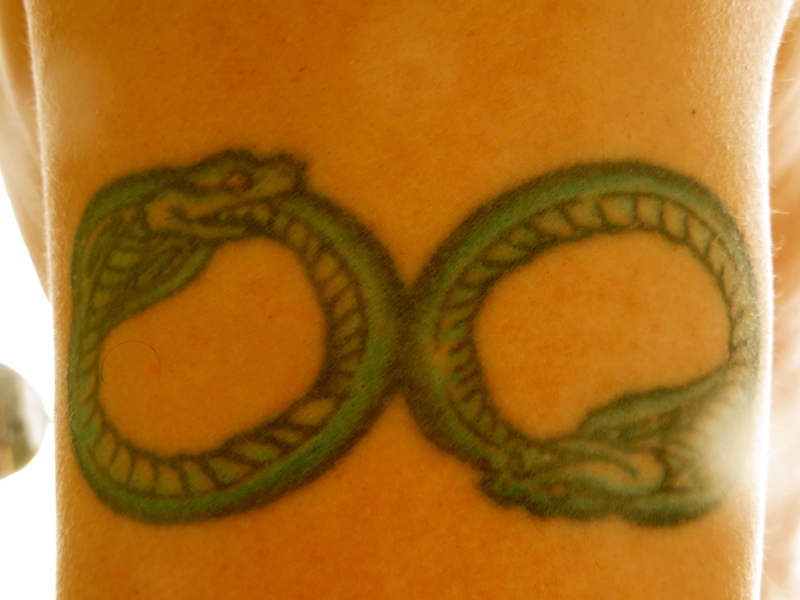 In almost every other mythology and culture, snakes and serpents are symbols of wisdom, of fertility and immortality. Twined around the symbol of Venus, the tattoo was ripe enough in symbolism to appease the rage within. It was another six years before I bared my skin again. Not due to pain or fear, or dirty needle back alley worries, but because the passion to remember the over-riding emotion was not there. Those intervening years had episodes of bleakness and whole lifetimes of darkness wound up in them. My heart was stomped; pock-marked with boot heels and stilettos. Any imagined journey of self-discovery took me down another mistaken path. Despite clinging desperately to the ragged edges of the black hole of depression that gaped before me, it sucked me in, head, heart, body and soul. I clawed my way out to emerge on the other side, finding not just a life worth living, but myself. Not a raging, shaved head young woman, not a confused young adult in love with the wrong man and the idea of love, not the sunken eyed, hollow shell that been sucked in, but someone else. Someone new. The sparks of anger and rage had dimmed, but stayed strong enough to keep the right things simmering. It wasn’t until the right man came knocking at my door, not so much giving me the keys to myself and my heart, but promising to safeguard the parts that I set free to him, that it seemed the right time for another tattoo. This time it was he that chose snakes, and I Aztec lilies . But both are rendered in two circles, not intertwined, but touching. Not infinity, but eternity. Together, and yet apart, each complete within itself, but stronger together. That was fourteen years ago. Years filled with both joy and heartbreak. Years that have produced marriages, births and other glorious moments of laughter and bright; but also death, moments of bleak and sorrow. I could have written volumes on my body, not even leaving time for the ink to dry between days, written in between the lines of myself with the symbolism and metaphor that prop up my soul. But it was only recently that I decided it was time to recognize a third facet of myself: Mother. Symbols and images of Mother–of birth, of Earth–are plentiful. 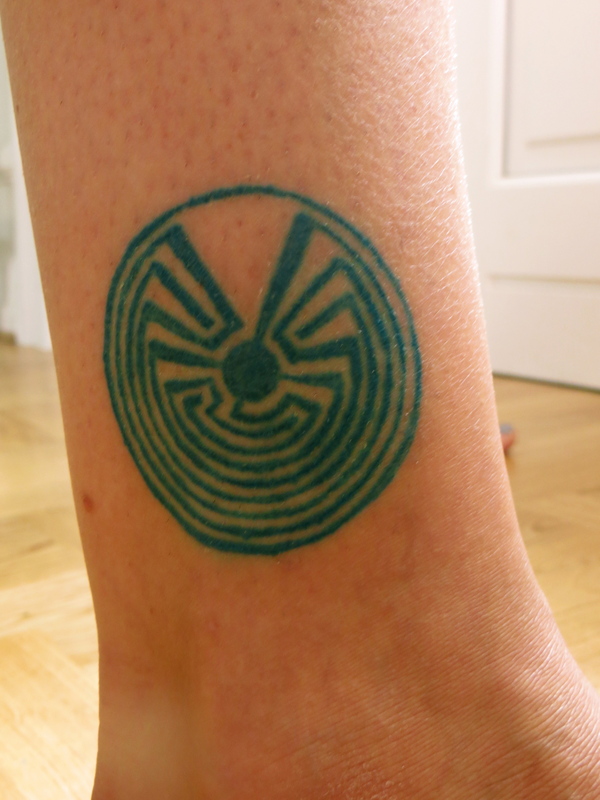 The Hopi sign I chose seemed to me to possess the right balance of simplicity and complexity. The labyrinth of life and birth, with no real beginning and no real end. The perpetuation of life. A maze. Just like motherhood itself. Woman. Lover. Mother. Past, present, future, written on the body. Needle and ink mementos of who I was, who I am, who I will always be. I’ve had regrets in my life, but I have never regretted the signs and symbols and meaning that I’ve decided to have etched onto myself. To regret that would be to regret my own history; the anger, the love, the self-sacrifice, all of the parts that make the whole, the things that together, form a me. **Some things really never change. Thanks, I like it too–I think I need some more–some sort of word symbol would be good. I’ll save the piercings (or more accurately the removal of the piercing) for another post. I think if you aren’t sure, don’t do it. I was (and am) sure about each one, which makes me appreciate them even more! I love this quote : “It wasn’t until the right man came knocking at my door, not so much giving me the keys to myself and my heart, but promising to safeguard the parts that I set free to him, that it seemed the right time for another tattoo.” This post is great. I never got a tattoo oddly enough. But if I had — I hope they would have the same depth and meaning as yours. What a lovely comment, thank you! Tattoos are funny because they are deeply personal, but oddly public. Mine are all on parts of my body that can be seen readily but also covered up if need be (though the older I get and the more ‘mainstream’ tattoos get the less I need to worry about it. But there are those that chose to keep their body work completely secret–which intrigues me. As for the man? Well, 16 years, 2 kids, several countries and many memories later, we’re still going strong. In fact, the tattoo I used at the top of the post is his latest–a tribute to me. He still makes me swoon ;-). Cheesy rice! I love that. I was also 22 when I had my first tattoo (I’m now 43) and mine are all in some way symbolic, like yours. I’m from the UK but had a large tattoo done in New York, as a souvenir I suppose, but also as a reminder of how incredibly euphoric it felt to be alone in such a fantastic city with no kids to worry about! In which case, I guess I was also celebrating being a mother BUT, for just a couple of days at least, one who didn’t feel too guilty enjoying a little time off. Great blog post, thanks for the link. Thanks for taking the time to read it. I thought (mistakenly!) by your comment you were on the fence about getting one! Even after having lived in NYC for 20 years, the majority without kids, I would love to go back for a weekend on my own or with my husband and just drown in the city all over again.